Giovanna Ferraro is a fit woman. Ok, maybe that’s an understatement. Standing at five feet, five inches, her biceps peek out of her workout tank top, sleek and toned. It’s a hard bod to match her attentive, determined, motivated attitude. But just because Ferraro’s not a pushover doesn’t mean the gym she owns, Groundwork Fitness, is ego-driven. Or that she isn’t constantly thinking about the greater Long Beach community, with programs like Keep LBC Fit and her work at curbing homelessness. Get uncomfortable to get comfortable. Obstacles and failure feed the soul to succeed. Radiate positivity and respect no matter what! Be a better person today than you were yesterday… repeat! It’s a mantra Ferraro knows intimately and practices daily. After all, she’s been many things: a firefighter, a ninth grade health teacher, a trainer and now a gym owner and community activist. Born in New York, Ferraro has lived in California since she was four years old. As such, she considers herself a California girl at heart, but still retains a bit of straight-up, East Coast attitude. Ferraro said her athletic childhood helped spur a passion for fitness. This passion exploded when she began training to be a firefighter after graduating from high school, a job she she says she “leapt” at the chance to do. “To this day, it’s the most physically challenging thing I’ve done in my life,” said Ferraro of her five years as a firefighter. It took her a year alone to complete training in order to pass the physical exam, something that made her look critically at the elements of her fitness training. This focus on fitness led to her certification as a trainer, a job she consistently kept as a part-time gig throughout the next steps of her life. After being laid off from the Pasadena Fire Department due to budget cuts, Ferraro seized the career juncture to attend college at Cal State Long Beach, something that had been in the back of her mind for years. And so, she moved to Long Beach and earned her bachelor’s degree in Health Science, with an emphasis on Health Education. The degree lead to a job teaching ninth grade health at a high school in South L.A. Two years into the job, Los Angeles Unified made cuts to its department, resulting in health education becoming an elective—even in parts of the district that needed health education the most. Ferraro decided she’d turn to full-time physical training once and for all. “After 10 years of experience, I decided I wanted to be my own boss,” Ferraro said. Being her own boss meant opening up a boutique gym in the heart of downtown Long Beach, on Pine Avenue, using all of her experience to create a program that enhances movement functionality and healthy living. But it didn’t happen just like that. Ferraro said she was attracted by the “cool energy” of Pine Avenue in downtown, took out a loan to operate her business, and officially opened the doors of Groundwork Fitness two years ago this month. Grit and community spirit helped her tough out the toughest first few years of a new business. Now, Groundwork has established itself as a community location, where local celebrities work out along with retirees and college students. Through the functional movement training, incorporating core work, strength and cardio, participants of the group classes and small group personal training cheer each other on to reach their highest fitness potential. Ferraro attributed the collegiality of her clients to the tone everyone sets in the gym every day, starting with her. Fitness, for Ferraro, is less about ego than community building, a passion she extends beyond the walls of her gym to the Long Beach community at large. She said she learned from her parents’ example as community leaders and small business owners of an Italian restaurant in the valley. “I always said, if I opened my own gym I wanted to give back to the community,” Ferraro said. Impassioned by her father’s eventual homelessness and death on the street, Ferraro is actively involved in Beacon for Him and programs to help the homeless at First Congregational Church. Ferraro is also the chair of the Downtown Long Beach Associates’ Public Safety Committee and a participant of the Pacific Gateway Workforce Investment Network, which pairs student interns with businesses, tapping into the owners’ network and experience to help the students further their career. In five years, Ferraro said she hopes to keep her robust client core and add new members of her team, with additional classes. For her, the business is about helping her clients in the long term—not keeping up with trends or serving as a quick fix for weight loss. “It’s about giving people a new take on their health and bodies, is what it really is,” said Ferraro, with her signature intensity. Again, it’s all about that energy. 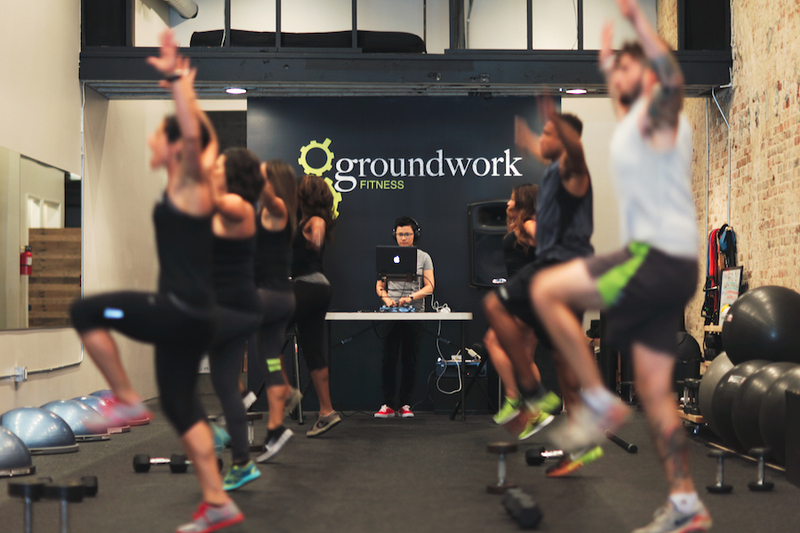 And at Groundwork, with Gio, that energy just might buoy you to the six pack of your dreams while connecting you to new, friendly members of the community. Groundwork Fitness is located at 333 Pine Ave.